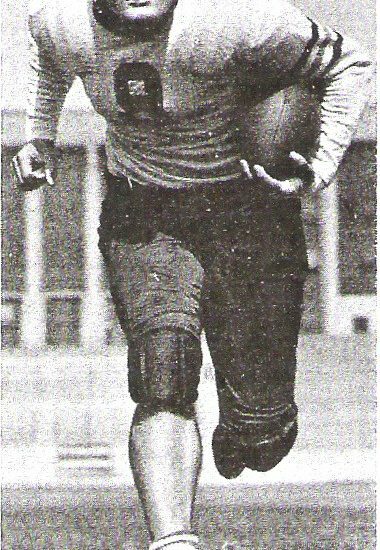 “Bullet Bill” Osmanski, a high school All-State fullback in Rhode Island, starred for nationally-ranked Holy Cross College in 1936-1938. The Crusaders won 23, lost 3 in that span. Osmanski was named an All-American his senior year. He moved on to pro football with the Chicago Bears after George Halas convinced him that he could study dentistry at nearby Northwestern University. In his rookie season, he led the NFL in rushing with 699 yards in 121 carries. He played on four world championship teams in his seven-year career with the Bears. Osmanski died in 1996. Dr. William (Bill) Osmanski began his great football career at Central High School in Providence, Rhode Island. 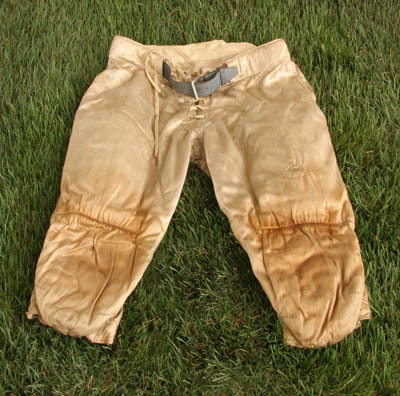 He earned All-State honors twice and led his team to the Class A state championship in 1934. He picked up the nickname “Bullet Bill” during his high school days. As a fullback, Osmanski was primarily a straightaway power runner who picked up most of his yardage through the middle. After graduation, Osmanski entered Holy Cross College. In his first year, he played freshmen football as well as baseball and track. The next three years proved to be ones of great success, both for the Holy Cross team as well as for Osmanski. Between 1936-38, Holy Cross was a nationally prominent football power. During these three seasons, the team compiled a 23-3 record. As a sophomore, Osmanski was selected All-East fullback. Bill’s coach, Andy Kerr, described him as “… one of the hardest running backs I have seen in years.” He repeated his All-East recognition his junior year. In his senior year, Osmanski was named All-American. Bursting speed, instinctive balance, controlled momentum and tackle-breaking power were Osmanski’s attributes on offense. On defense, Bill’s instant response and vicious aggressiveness behind the line destroyed opponents’ plays often before they reached the line of scrimmage. Osmanski was chosen to play with the College All-Stars in 1939 against the New York Giants. His performance in the game earned him a contract with the Chicago Bears. However, Bill was not interested in playing professional football. Bears’ owner and coach George Halas convinced Osmanski that he could study dentistry at Northwestern University while playing pro football. In his rookie season, Bill was the leading ground gainer in the NFL. He was also selected to the All-Pro team. The following season, he was again selected All-Pro as the Bears won the world championship. Osmanski played on four NFL championship squads during his seven year pro career. He left the Bears in 1943 to serve as a medical officer in the Marine Corps in Okinawa and other South Pacific posts. Upon his discharge from the Marines in 1946, he rejoined the Bear and played in the same backfield with his brother Joe. He retired from playing in 1947 and returned to Holy Cross to serve as head coach for two seasons before deciding to devote his full attention to his dentistry career in Chicago. Osmanski is a member of the Collegiate Football Hall of Fame, the Helms Foundation Hall of Fame and the Pro Football Hall of Fame.